I absolutely love living in the Canadian Rockies. It is an amazingly beautiful part of the world, but sometimes I find myself getting stuck in a rut. 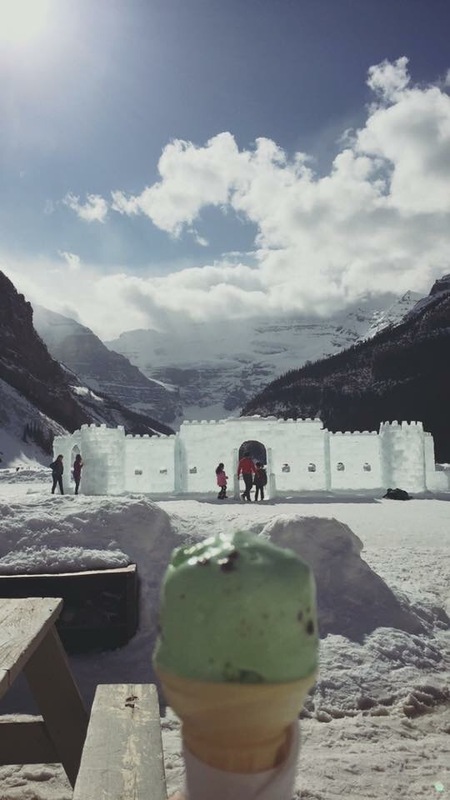 Lake Louise is isolated so some days I do get cabin fever, or depressed when I’m stuck with nothing to do but to go to the pub or sit at home and watch Netflix. Yes, there is amazing hikes, canoeing and just simply the magnifying mountains that stand before me. There is simply no reason why I shouldn’t feel healthy when there is a staff gym as well as our own outdoor playground. But, in my quiet times, I look at people at home who are getting married and having families and have networks of people who also have their own little families. The most amazing little miracles happen everyday, more amazing than planet earth itself that I am beside myself that in the coming weeks, I am going to have my very own beautiful little nephew. I am so unbelievably excited about this. With that, I am now 25 years old, and one day recently, that fact actually caught up to me. I want a family one day too, I want the house and the picket fence and my dog, and it gets me down sometimes that my life isn’t there yet. So, I work and I travel. Travelling, has always been my first love. And finding myself and my place in the world comes after that and today I finally felt myself have the epiphany I needed to break out of my rut. I spent some time with my friends and realized, I know where I belong in the world and who I am. What my strengths and weaknesses are. What kind of people I need around me that support the positive energy that floats from within me. I love my work but I hate the dangerous vortex of the Lake Louise pub lifestyle. I love my friends and the supportive network of a sisterhood we have created but I hate how depressed I become when I have a moment where I feel lost or alone. I love the fresh mountain air and the most breathtaking scenery that lays before me everyday, but I hate the fact that sometimes, I can feel trapped by it. I don’t need real or metaphorical mountains to tell me where I belong. I just know I belong in the world that is continuesly evolving and to not be afraid of it. I belong in a world of writing and inspiring. Which is why I blog. I also belong in the world where I love my job and the way I can make someone feel better about themselves. I know that I have that and I feel blessed for it everyday. I don’t necessarily need the house with the fence just yet, because I know one day it will be my turn. It’s okay to have bad days, I just need to remember to talk about them instead of letting things stew in my mind. I may need more of a sense of normalcy at some point, and that’s okay too. But for now, I am enjoying the wonder of the world that is the Canadian Rockies. Because the day I look back when I do have the house with the fence and the dog, I want to know that I made the most of my time out here. I want to write this blog for everyone who has ever thought about writting or blogging, but just never ‘got around to it’. It’s an easy enough excuse or reason. I used to have the same reasoning. Until one day I just started writing. Writing and writing and writing. I began writing my book four years ago and I have now been blogging for about 18 months. I don’t always have a lot to say, or anything in general, but when I do, it comes out like an erupted volcano in my mind! The words just flow one after the other which is why I always carry a pen and paper with me to jot down my notes and thoughts. I think I may also have a slight case of ADHD and anxiety which keeps the thoughts going constantly haha. That aside, why do I write? I write, because I am passionate about it. Between other jobs that I have had previuosly and now my current job, I have still managed to find time to complete the book and try as much as possible to keep my blog up to date. I do it because I am passionate about writing. Some do it for a full time job, and I know why! There can be a lot to it. Noting your thoughts, putting things together, editing and proof reading, keeping up to date and current! Or you can just do it, because it is something you are passionate about. For me, it all began with writing notes in my ‘notes’ section on my iPhone. Yeah, it was that easy. That is where my book began. Then one day, I looked into different blogging websites and came across wordpress (ah my godsend). This website has an app that I have on my phone, so that if I want to write something on the spot and I am not at my computer or I am out, I just jump onto the app, makes some notes and safe the post as a draft and go back to it later. Some days, some of my posts can take me up to a day to complete, some might only take half an hour. But I do it. I do it because I am passionate about writing. I don’t know why, but for the longest time that I can remember, I have always had something to say. An opinion or an idea that i just need to share. Instead of talking the ears off of my friends all the time, I just started writing. If you think you want to give blogging a go too friends, I recommend it! If your reading this post, you are already one step towards the rest. Sign up to wordpress and just make one simple little blog. Explore the website, see where the links and buttons take you. Blogging is a wonderful and artisitic outlet. I can’t believe that as of April 2015, I have now written 141 post, I’ve had 1,977 views and 970 different visitors to my blog. All I have been doing for the last 18 months is write an online diary. That’s all. If your still not convinced, carry a pen and paper around with you. When you think that there is something that you want to write about, an idea or project, just jot down the notes at the time and go back to it when you have time. Before you know it, you will have a whole book of notes and ideas. I encourage you, if you are passionate about your thoughts and writing, just do it. It doens’t even need to be for the rest of the world to see right away, it might just be the most therapeutic thing you will ever do for yourself. Tuesday August 9th 2016 – It’s been a year already..
Today, is one year since I left Australia for my big overseas adventure. A whole 365 days had gone so quickly and I wonder how the time has really flown by. I never expected it to go so quickly, but somehow, between work, socializing, exploring and meeting some truly incredible people, another year in life has come and gone. Everything that I do, that I save for and think about is where the next destination is. What is the next adventure? Where else in the world do I want to explore. The more than one travels, the more focused they are in doing so to keep traveling. 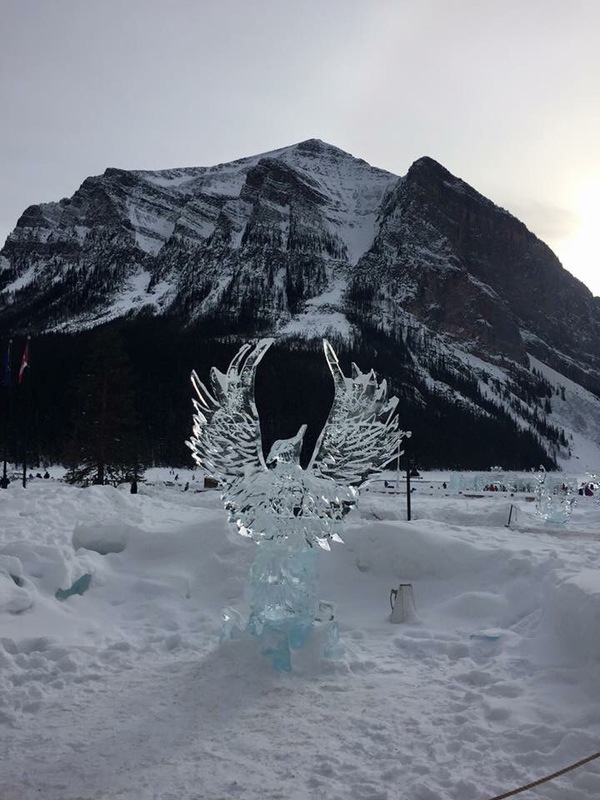 I have seen so many wonderful sights in the last year in the USA and here in the Canadian Rockies. This continuesly inspires me to want to see more. 2. Bad things will always happen whether you are travelling or not. Don’t be afraid of something happening and letting it stop you from travelling. Whether some one is sick or going through a hard time, life will continue to go on. I don’t mean to describe this in a selfish way, I just mean that sometimes it can’t be helped when something happens and you can’t be there for your family in the flesh. Things have happened back at home in Australia in the last 12 months, things that I would typically be around my family for in a time of need. Unfortunately, being on the other side of the world from your family can have its challenges. Being away doesn’t mean I don’t care, it just means I am chasing my dreams, and realistically it can be difficult to be home at short notice. I speak to my family regularly over Facebook chat and on the phone a lot. I wish I could be there more. Each and everyday is a new and exciting adventure! Something new is around each corner and you can never expect what will happen each day. 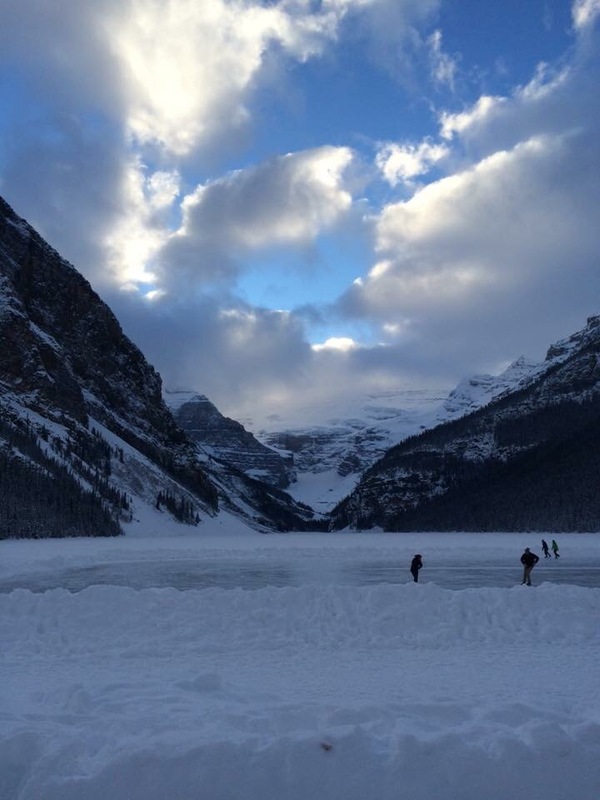 Lake Louise is so beautiful that it blows me away. I still pinch myself every day that the view is constantly changing and evolving with the weather and the season. 4. Through traveling, you find like minded people. People are like magnets, what we are is what we attract. I find myself to be a happy, positive and outgoing person. That is also the sort of people that I seem to attract. I have met people out here that lived unique and interesting lives and I find them fascinating. Like Buddha says “What you think you create, what you feel you attract, what you imagine you become”. 5. 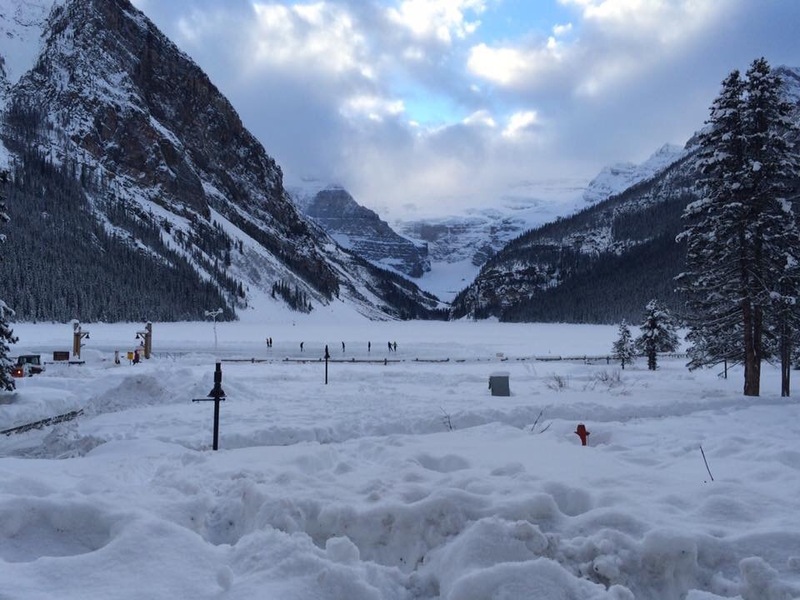 Lake Louise is it’s little own unique snow globe. 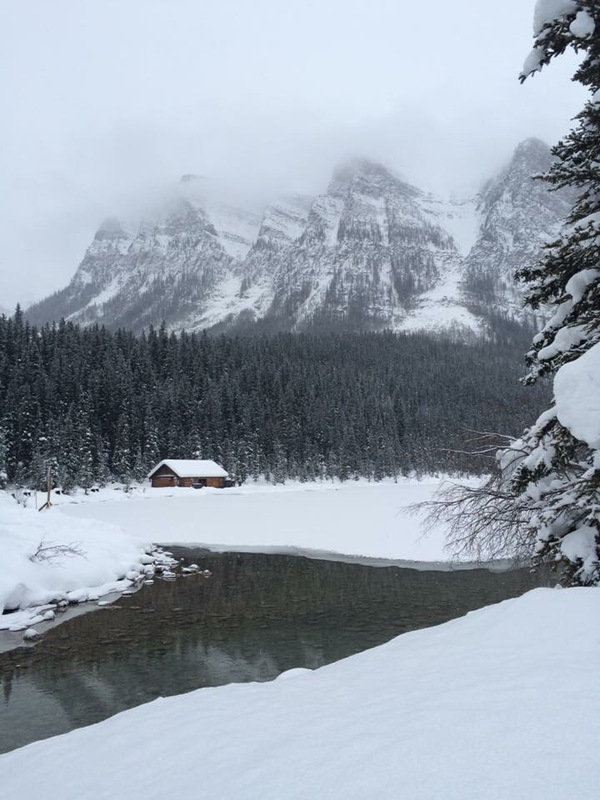 If you are looking to work in Lake Louise, or most places in the Canadian Rockies, be prepared for the isolation. 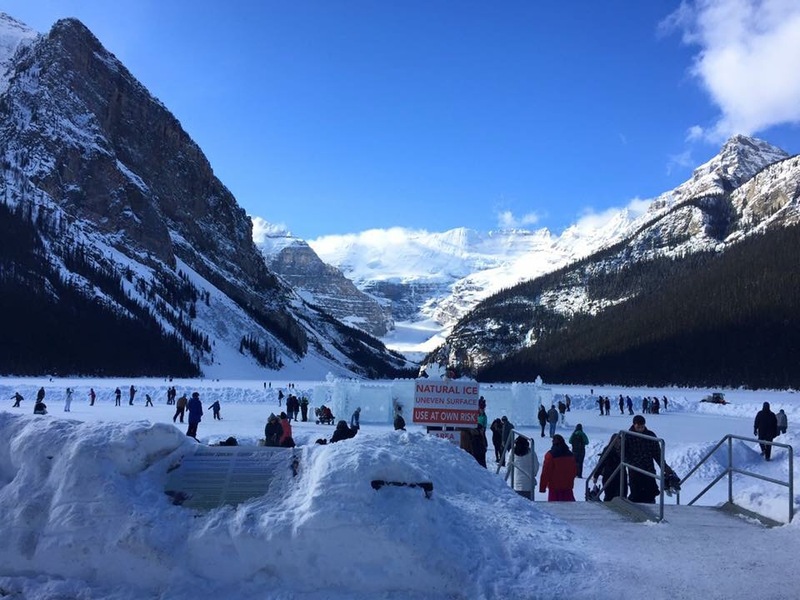 Some people aren’t up to handling the isolation out here, but for those who enjoy the tranquility, Lake Louise is perfect for you. 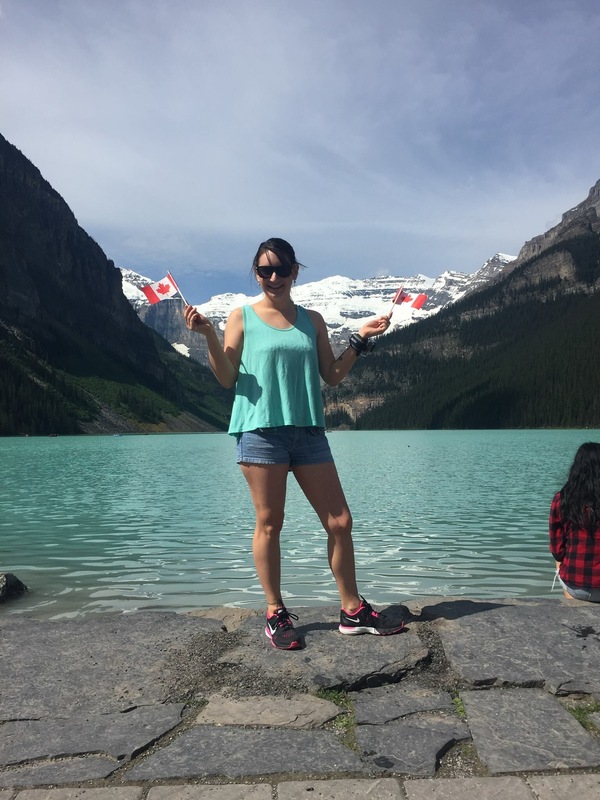 Lake Louise is 1,600 meters (5,200 Ft) above sea level. The air is much thinner and the life is much quieter. Coming from a town with a population of 35,000 people and a car, my local coffee shop and several shopping malls, I underestimated the feeling of being part of a town and society. Here in Lake Louise, I don’t have nor do I need a car. I get my groceries about once a month from Canmore where I car pool or get the shuttle and my days off are spent hiking or sun baking. We have a small colleagues takeaway shop that stocks toilet paper and other bit and pieces of groceries and a staff pub next to it. It is a rare opportunity that when I do go away for a few days to Calgary or other places, I realize again what society in a normal city is like. Traffic jams and sky scraper buildings. People rushing about on the concrete side walk on the way to work or appointments. 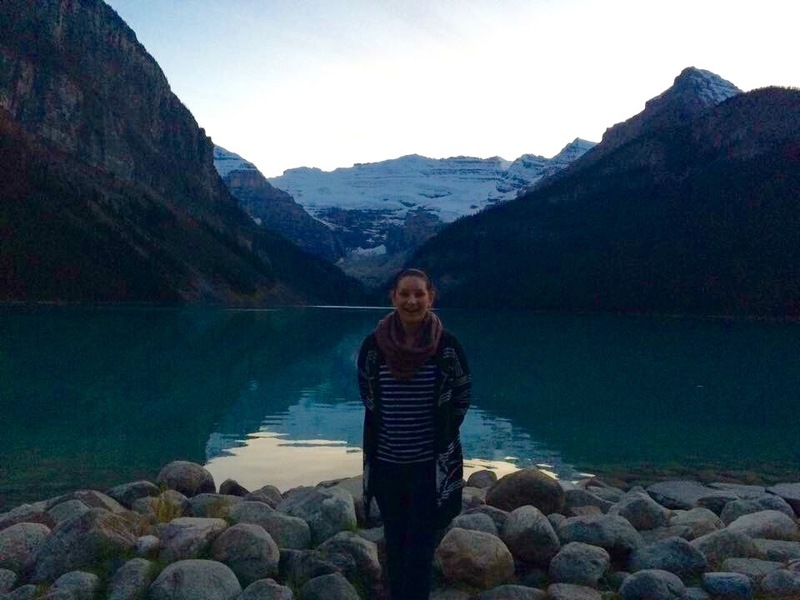 I love the peaceful tranquility of Lake Louise. I walk to work which takes me 5 minutes. The staff accomadation is like dormitory style. I live in a building that has foor floors, 11 appartments on each floor and in each appartment, is 2 rooms with queen beds. I have my own room and share the appartment with another Australian. All of our spa friends live in the same building, and when ever we want to visit our hang out or pre drink before going out to the pub, we just walk down the hallway and we are at someone else’s house. This is a different way of life. This isn’t like living in a town of 35,000 people where I have my dog, a car, tupperware parties and my local pizza take away shop. It’s not wrong, it’s just different. And I’ve never been happier. The other day a friend commented on my domain name ‘thatweirdchic.com’, and it got me thinking, not many people know or understand the reasoning behind the name. In present day moment, I embrace the term ‘that weird chic’. I am proud of it and take complete ownership of it. Without having an actually copyright or trademark to the saying, I own it! To me, being weird is being unique, an individual. A person that questions why and has an opinion on EVERYTHING! And I don’t care. I don’t care about people’s negative opinions of me and people who waste my time. I enjoy learning new things from talented and experienced people, I surround myself with positivity and I give off a positive vibe and say ‘Hi’ to every single person I encounter with a smile. If that makes me weird, all the best to me! But it wasn’t always this way. It wasn’t always rainbows and sunshine. Being weird wasn’t always a good thing. Being ‘weird’ got me down and hurt my feelings. After spending nine months away from home when I was diagnosed with bone cancer, and going in and out of hospital, I returned a different person. I person who had forgotten how to socialize. An almost teenager that was trying so hard to fit back into a life that no longer existed. Most of my friends from before I was sick, all of a sudden didn’t know how to act around me. They didn’t want to say things ‘incase it hurt my feelings’ or just saw me as a whole different person all together, someone that no longer belonged. I was socially awkward and always said the wrong thing. When I went into high school, there were people from other schools that weren’t aware of my history, but just saw me as the girl that had to walk with a walking stick for a while and an obnoxious leg brace. They saw me as a shy, quiet individual that maybe wasn’t always quite there. That is what they saw. What was really happening was me trying so hard to be friends with people that didn’t understand me or what I had been through. I gave up on trying and became, ‘that weird chic’. I can’t remember if some one had said it one day or whether it was something that I had come up with in my head after one too many strange looks from people. After surviving high school, I decided that being weird was a good thing. Being different is a good thing. Being a survivor is an even better thing to be, and if that makes me weird, I’ll take it any day! As many of you may or may not know, I have three incredible famous women who I idolize! 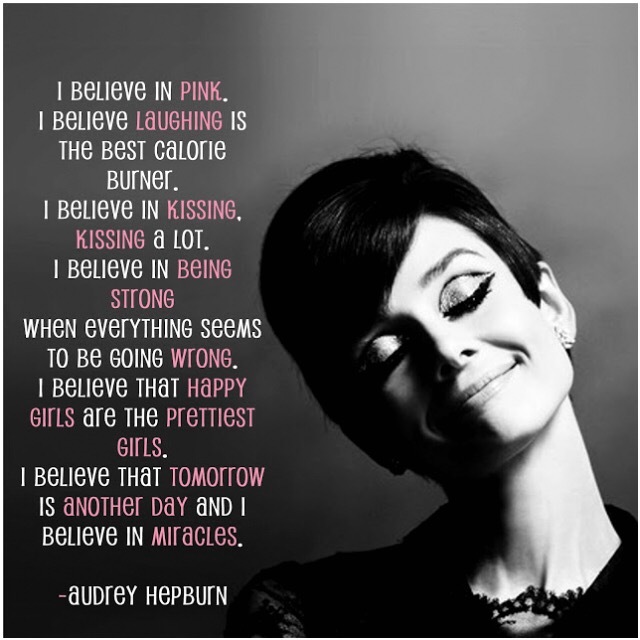 One of those women is Audrey Hepburn. Not only was she a fashion icon of the golden age, but a women who glowed independence, happiness and generosity to the world. She believed that anything was possible. And because she believed, she made things happen. She made things happen for herself and for other. All it takes is a little bit of self belief, and you can achieve anything you set your mind to! Most of all, she believed in being the woman she was meant to be. She believed that women all around the world should be themselves and that is when they can be at their best. She believed that in a man’s world, she could conquer her own world and rise above with strength and grace. She had power in her own rights. Today I want to talk about the quote “You have power over your mind- not outside events. Realize this and you will find strength” – Marcus Auelius. I came across this quote a long time ago and it has stuck with me ever since. I have even referred to this quote in my book. The reason I love this quote so much is because it made me realize that I am the true sorcerer of my destiny. I could do as much as what my mind will let me. If you believe so much in your mind that you can achieve something, it really is possible. This is also relevant for negative thoughts. When you feel down or upset about something, think about how you can change it. Think about who the only person is that can make you happy. Forget about everything else in life, you have power over your own mind to make yourself happy. If you are constantly thinking positively, it becomes habit and the more you can constantly achieve. Finding the strength to think positively can be a challenge sometimes if outside events keep getting you down. But I’ve learnt that you can’t change the people who don’t like you, or the mistakes you’ve made in the past, you can only learn from them, and you are the only person that has the power to do this. The mind is a very powerful tool and can go one of two ways. To keep your mind on the positive side of the spectrum, keep practicing happiness everyday. Say hi to people, smile and wave and people will smile back. Happiness is contagious as well as positive people. Surround yourself by positivety and the ‘outside events’ may not seem as bad.